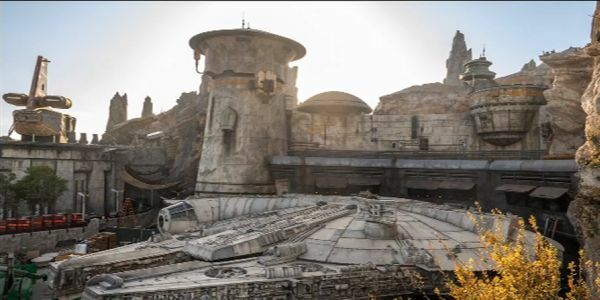 One of the first things we learned about Star Wars: Galaxy’s Edge‘s Millennium Falcon attraction was that it would be possible to bring the iconic ship back in great shape, and it would also be possible to bring the ship back severely damaged, depending on how you and your flight crew performed your duties. However, beyond a few passing comments, we had little idea exactly what that meant. Today at Star Wars Celebration we learned a little more about what can happen after your flight in the Falcon is finished, and how you’ll be able to see just how good, or bad, a job you did. The idea that the results of your Smuggler’s Run experience would continue after the attraction ended had been part of the description of the attraction since early on, but what we heard about most was that you might run into somebody at Oga’s Cantina who could respond to you in a particular way based on your experience, but this is the first we’ve heard that the Falcon itself would show the results of your ride. Star Wars Celebration did show off the hallway in question in good condition, we didn’t get a chance to see how it will be different if you do a bad job..
Everything else we know about how your Smuggler’s Run experience will impact the rest of your time on Batuu involves the idea that cast members or animatronics might react to you differently based on how well you did on the ride. We also got to see more of the Hondo Okana animatronic that will be part of the attraction. Asa Kalama spoke about how Okana himself will react to you if you beat up his ship too much. The more we hear about Stars Wars: Galaxy’s Edge, the more exciting it becomes. We’ll finally get a chance to experience it all when the new land comes to Disneyland May 31 and Walt Disney World August 29.